In one of my previous posts I wrote about Why epoxy floors fail. Following the comments I received I was inspired to write this article about ‘sticky’ epoxy. By the term stick epoxy I mean two-component resins coatings that don’t cure properly. If something like this occurs, the results can be disastrous. The only solution is to basically remove all the sticky coating with a spatula, clean the substrate and re-coat it. – Lazy mixing. This occurs when the resin and hardener are not mixed properly. Most systems need to be mixed for at least 3-4 minutes with a proper electrical mixer. Some workers think they can mix the screed with a stick, others are too impatient to mix for more than a minute. – Improper use of proportions. Each epoxy system comes in its own sets and with its specific proportions of each component. Sets should be applied as they are provided by the manufacturer. Don’t try to mix ‘a little bit of A’ with ‘a little bit of B’. There is no guarantee that the systems will cure properly. If it is absolutely necessary to mix a small amount do it properly with a scale accoring the proportions provided by the manufacturer. – Working with old and expired products. Most coatings have a tendency to have their solids sink to the bottom of the bucket over time. This means that if the product has not been used in a long time the resin is not evenly distributed throughout the bucket. That is why it is recommended to empty all the contents of the bucket in a new container and to mix it properly before applying the product. If the product is past its due date its best not to use it all. Concluding, I need to emphasize that supervision is key here. Inexperienced workers need to be supervised when preparing the screed. 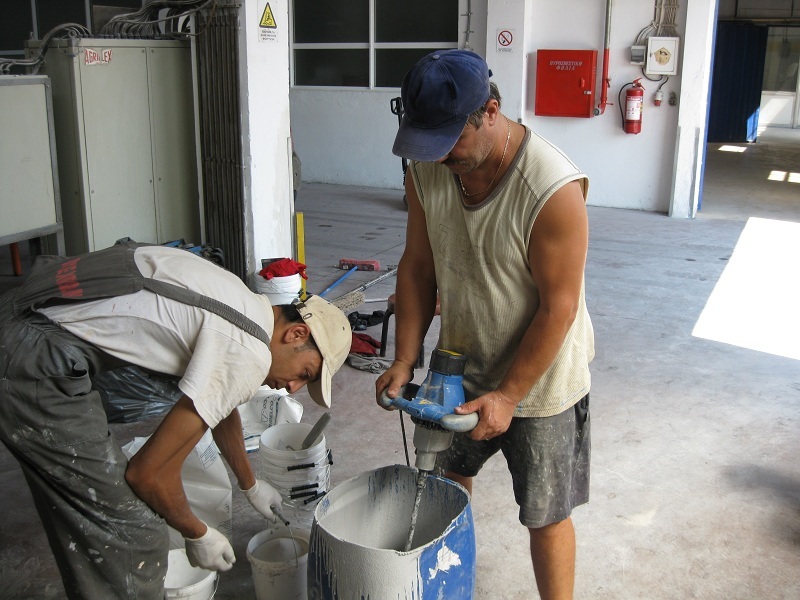 Many workers think what applies for cement, or wall plaster also applies for resin coatings. This is not the case. The application of resin coatings required specialized knowledge.